"A society committed to the search for truth must give protection to, and set a high value on, the original mind, however angular, however rasping, however socially unpleasant it may be, for it is upon such minds, in large measure, that the effective search for truth depends"
During most of the last century the scientific community has considered the possibility that the Earth’s axis (and the poles), or the Earth’s crust has shifted during the last 200,000 years or so, perhaps several times. In 1958 (updated 1970) Charles Hapgood presented his theory (along with 458 references!) that both the poles and the Earth’s crust have shifted several times in the last 120,000 years. He maintained that the last four rounds of the poles started 120,000 years ago when the North Pole installed itself in the territory of Yukon in Canada at 63 N and 135 W; then it went to the Greenland Sea at 72 N and 10 E about 84,000 years ago, moved from 54,000 until 48,000 years ago and settle in the middle of Hudson Bay at 60 N and 83 W; it rested there for 30,000 years, then wandered again from about 18,000 to about 12,000 years ago when it came to its present location. He uses evidence from geomagnetism, continental drift, the failure to explain the ice ages, the failure to explain climatic changes, the sudden melting of the ice sheets, the shaping of earth’s surface features, the evidence for violent and rapid extinctions. Recently F. Barbierio (1999) addressed the pole shift hypothesis by arguing, using mind-numbing mathematics, that the Earth’s poles could be rapidly shifted due to the impact of objects from space as small as a half-kilometer diameter asteroid. And so the argument continues in the scientific community. 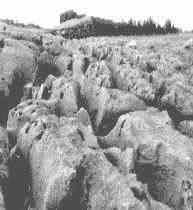 He demonstrates that most of the important ancient megalithic sites lay on the equators during the last 100,000 years, and that it was because “It is preferable to land a spaceship near the equator than in a polar region, just as it was with our landings on the moon.” (the speed at the surface of the earth at the equator gives an added eastward push of about 500 meters/sec). He says, "The polar rounds and the shift of the equator also explain why we have found traces of civilizations in regions of the Earth that today seem unfit for human habitation…". He goes on to demonstrate that many of the ancient megalithic sites lie on of close to one of these prehistoric equators. Reading this it occurred to me that the remarkable concentration of ancient sites on or near the path of the prehistoric equators suggested that the AAs approached the Earth through the solar plane, probably to use the planets for braking, lined up on the Earth's equator to land, and built their sites very close to the equator. Seemed reasonable - at the time. In a superb up-to-date discussion of this observation Alison (2001), using a bit of reverse engineering, lists nine sites which would lie on the equator 120,000-84,000 years ago, another six which would lie on the equator 84,000-48,000 years ago, and nine sites which would lie on the equator 48,000-12,000 years ago (The site lists are from Alison but the estimates of the time periods are from Hapgood (1958)). Now if we assume that these sites were located during the current pole position (12,000 - present) the resulting pattern of the locations on the Earth is a precise harmonic wave, as Alison nicely demonstrates. Alison lists sites which are within 70 miles of the equator of the time; however, when we consider that the poles wandered for about 5 thousand years before settling, I think we should allow a little slack here. Using Alison’s coordinates for the poles the following is Alison’s list with my additions of the sites which are within 5 degrees of the last four equators (* indicates those from Alison’s list). These are just a few of the better known locations; I suspect if one were to search a good archeological atlas along the equators many more would be found. There is an undeniable coincidence between many of the most important ancient sites and the prehistoric equators. Oops - we have a problem: None of the equators pass close to the Mesoamerican sites (Teotihuacan, etc). Possible solution: archeologists think they were built much later. Oops - we have a BIG problem: None of the equators pass anywhere near the important European sites (Stonehenge, Brittany, Bogazkoy, Malta, etc), and these are very old. The pattern of the landings on the Earth would indeed be a harmonic wave. England, Brittany, Yonagoni, Columbia Arch. Zone, Lhasa, Indus Valley, Mexico and Yucatan Peninsula, Ethiopia, Nazca, Delphi would now fall on an ancient equator. Oops - we still have a BIG problem: Most of the sites in Alison's list above would not be anywhere near one of the equators. Sometimes their landing/departure was parallel to the Earth's equatorial plane, as if they used the planets for breaking or accelerating, then lined up on the equator to realize the benefits of the Earth's rotation. Tidbit 1: Geologist Robert Schock (1999) discusses the theory of Kirschvink and others that the "Cambrian explosion" was due to a 90 degree shift of the crust, not the interior of the Earth, which he calls "true polar wander". Tidbit 2: Zecharia Sitchin (1993) concluded that about 11,000 bc (13,000 years ago) the Earth’s surface shifted causing the ice cap to slip off, which in turn caused the deluge. The seems to agree fairly well with Hapgood’s estimate of the last pole shift, between 18,000 and 12,000 years ago). Tidbit 3: Childress (1999) presents diagrams of the four yuga cycles of the 6000 years from 22,000 bc to 2000 a.d., and the great yuga cycle from 46,000 bc to 22,000 bc. Interesting that the great cycle corresponds closely to the period Hapgood gives for the 3rd position of the polar axis (48,000 to 18,000 bc), and that the recent cycle corresponds to the present pole position (18,000 bc to present) (Hapgood, 1958). It’s well known that when cultures are replaced their sacred sites are usually adopted and incorporated into the current culture's traditions, apparently in an effort to entice the people to the new culture. This happened throughout the Americas during the Spanish conquest and evidently in England where the ancient “old straight tracks” (ley lines) now trace religious sites erected within recent times. Of course I am not suggesting that the structures currently at these sites were built during the periods of the prehistoric equators (nor does Alison), but I do suggest that most of the site locations were first visited during these periods, and probably were points of contact between AAs and humans in prehistory. Has the god Zeus talk of being fed by the mortal King Priam. “One the first day…thirteen young bullocks, two rams, and fourteen lambs of the first year…and a goat”. He also demanded flour, oil, and a drink offering. This goes on for seven days, so that close to 100 bulls, 100 lambs, and 20 rams were fed to his cadre during this one week. My impression of the site of K’enko in Peru was also one of the many places where AAs were fed. Their aircraft landed on the rock above the altar and scared it deeply (Fig 2-1). 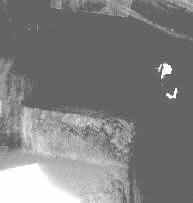 There was a cave and altar under the rock and legend has it that food was taken up into the craft through the hole in the top of the altar (Fig 2-2). Human sacrifice was practiced at virtually all the ceremonial sites of ancient America. This gruesome ceremony and other blood-letting practices, occurring in the later stages of these societies, were apparently the last desperate efforts to entice their gods to return. Woolley (1965) writes that the prehistoric graves at Ur revealed that humans were fed to the gods, but this custom was later discontinued and animals were substituted “The lamb is the substitute for humanity; he hath given up a lamb for his life, he hath given up the lamb’s head for the man’s head”. Boulay (1999) also writes about human sacrifice: "One of the ways to appease the gods and make 'bonus points' for eternity was by human sacrifice. Before the Deluge human sacrifice was not only common but demanded by the gods. Human sacrifice continued for some time after the Deluge and seems to have ceased as a deliberate ritual about the time of the aborted sacrifice of Isaac by his father Abraham. Animals replaced humans and this change is clearly described in the books dealing with the Exodus, where the 'burnt offering' can be seen as an obvious cooked meal for the resident deity." The astonishing assumption underlying these clues is that the gods and Earth's animals (and humans) shared the same biology!